A large crowd of pro-Palestine activists gathered outside the convention center in Washington, D.C., to protest the annual summit of AIPAC, the American Israel Public Affairs Committee. The demonstration, held March 2, was initiated by CodePink and supported by a wide range of anti-war and international solidarity organizations, including the ANSWER Coalition. AIPAC’s yearly gathering draws dozens of members of Congress and other top U.S. government officials, along with representatives of corporations that profit off of Israel’s oppression of the Palestinian people. Israeli Prime Minister and notorious war criminal Benjamin Netanyahu gave a keynote address to attendees. Despite the cold temperatures and rain throughout the day, the crowd maintained a constant presence at the front door of the convention center. Favorite chants included “AIPAC, AIPAC you will learn, the refugees will return!” and “When people are occupied, resistance is justified!” Protesters demanded an end to U.S. aid to Israel, which in large part finances its murderous armed forces. 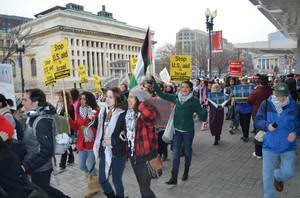 The protesters, who at times formed picket lines that stretched the entire length of the convention center, made it clear that there is a growing movement to reject AIPAC’s agenda and support the Palestinian people’s struggle for the right to determine their own destiny.